Currently, I conduct about 15 different tours throughout the year to 10 – 12 different locations around the world. Most of these trips are geared towards adventurous photographers who want to go on unique wilderness outings and expeditions, however, I do offer a range of instructional options for all physical ability levels and skill levels. My trips fall into roughly three categories: 9-21 day wild adventure/expeditions, 5-9 day US/Canada location trips, 3-4 day processing seminars and associated group photo outings. All of my trips regardless of ability level yield excitement, adventure, and amazing images. Also, you will benefit from the best and most personalized instruction you can find on any small group photo trips out there. All trips include discussions and free videos on my first-of-a-kind post-processing techniques and philosophy that have helped shape the modern generation of landscape photography. 95% off all trip availability has fills up 8-24 months in advance, when trips are first announced to my mailing list. Please use this link to CONTACT ME and inquire about signing up for the mailing list and to receive additional information about any of these adventures! The Canadian Rockies in Winter! Dates to be announced soon for 2020. Contact us to subscribe to the mailing list and be the first to hear about new openings, as these tours sell out quick! This coming January I will be conducting a few of my 6-day photo adventures in the Canadian Rockies, where we chase the light and explore the very best winter has to offer. Half of all the images you see on this website were shot in winter. Winter is the season of simplicity, the season of beautiful low angled light, the season you have away from the crowds, and the season where we see everything for the first time. It is my paradise, and nowhere else in North America is winter in the mountains accessible the way it is in Canada's Rockies! The most beautiful scenery is beside us at all times throughout this 1000km journey spanning nearly a week and 5 national and provincial parks. Tour price includes all outfitting of heavy parkas, ice cleats, mittens, hand warmers, etc. as necessary! Price also includes all meals, dedicated and continuous instruction throughout and dozens of post-production videos yours to keep. Lodging options to fit most budgets are available on a nightly basis, and arranged for you based on your preferences. This trip is among my easiest and no significant hiking is required. Certain locations may involve positioning the camera at very low-angles and/or stepping onto rocky/icy terrain when moving into position to shoot. We will meet in Banff, Alberta at noon on the day the trip starts. Getting here from Calgary requires one of two things - your choice! You may volunteer as one of our group drivers and rent your own car at the airport or you may take the Banff Airport Shuttle to our meeting location direct from the airport (https://banffairporter.com). Upon meeting, we will carpool from spot to spot throughout. Drivers will receive some discount towards their trip price depending on number of volunteers. Roads are very easy to drive for the most part, though often covered in packed snow. Deposits are usually refundable or transferrable in the event of cancellation up to 2-3 months prior to departure. Please contact me for more information. Please use this link to CONTACT ME and inquire about signing up for the mailing list and to receive additional information about this adventure! February 17 - 22, 2020 - 1 spot available! March 9-14, 2020 - 3 spots available! This February and March I will be leading a small group of photographers on a photographic adventure through the spectacular and diverse landscapes of California’s Eastern Sierra and Death Valley National Park! Our tour will span six action-packed days and often cover a breathtaking number of locations over the course of 1000+ miles. 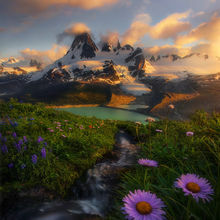 This trip will feature many of the most unique and fascinating landscapes on the continent at the best time of year for photography here, early Spring! 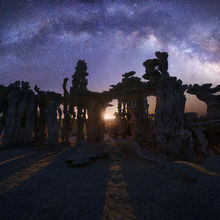 Wildflowers are at their desert peak, skies are often interesting and night photography is close to the best moon cycles of the year for light and Milky Way combined! This tour will cover everything from the classics to new techniques and whole new ways to look at the photographic art in today’s age! Tour price includes all meals, dedicated and continuous instruction throughout and dozens of post-production videos yours to keep. Camping and lodging options to fit any budget are available. This trip is meant for most everyone and is considered the easiest of all my trips physically. We will meet in Bishop, California at the beginning of the trip which is a beautiful drive away from either Las Vegas or Los Angeles. You can even fly strait into Mammoth Lakes, just 30 minutes up the road if you don't mind one more connection. Most of my clients like driving, and some of them even use their trucks or SUV's as beds if camping proves more convenient as I often do myself! Others prefer carpooling options with other participants, which I help to arrange before every trip. Our meeting location is at least a few hours away from any airport, so allow some extra time to get out here to the most relaxing and remote part of California! April 8 - 27, 2019 - only 2 openings still remaining! You have seen the pictures. 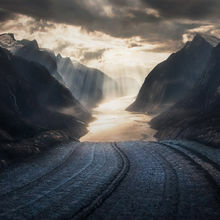 The world’s steepest and most dramatic mountain ranges, ‘fins terre’, ‐ the end of the Earth, as they say. But all that you have seen before, Fitz Roy, Cerro Torre, the most photogenic monoliths on the planet, these are only small points in the sea of unbelievable mountains that encompass the spectacular southern Andes. There are no roads, trails and not even helicopters can connect you to the other 90% of the mountains in these great ranges! 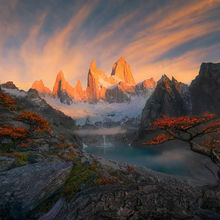 In 2020, I am going to take you to see the UNDISCOVERED Patagonia. On this expedition you will be among the first people on Earth to get to photograph these ranges, in their entirety, from the most glaciated side of the mountains thus far unexplored by any other commercial photography trip ‐ the central and northern fiords of Chile. More than just exploration of new lands in the fiords, this huge 20-day trip will also feature shooting of the great icons in this region. Nobody leaves this trip without great hiking to areas around Torres Del Paine, Fitz Roy and Cerro Torre, but even these locations, often called the world’s most photogenic mountains, will be photographed on our trip differently than you have seen before, utilizing backpacking and multiple local guides and porters to enable you to reach far off‐trail locations we have received specialized permission from the parks to enter. Included in the trip price are all meals, outfitting of outdoor equipment as necessary, all transportation, multiple different boat plus crew, porters and additional guides as needed and dedicated and personalized instruction throughout. This trip is non‐stop adventure at it’s very purest. It requires of you, however, the dedication to hike up to 10-15 miles in a day on certain days, or up to 5 miles at a time over rough terrain with a 40‐pound pack. Much of the equipment needed for this trip will be supplied (and sometimes carried) by our guides and outfitters including your tents, sleeping pads, stoves, fuel and food, however. Also required for this trip is a medical questionnaire and international rescue insurance, which is always a good idea when traveling abroad. If you are looking for the trip of a lifetime, this is it. We will meet in El Calafate Argentina right around noon on the day the trip starts. This is accessed via international airport and connection in Buenos Aires. Most itineraries require changing airports in Buenos Aires too, so please ensure you allow at least 4 hours for layover there, and most opt to spend the night. Usually allowing a full 36 hours of travel time to and from the 'End of the Earth' isn't a bad idea, but when you get to Calafate it's all easy to travel around from there. Deposits are sometimes refundable or transferrable in the event of cancellation up to 2-3 months prior to departure. Please contact me for more information. 2020 and 2021 dates will be announced soon for a unique winter trip to Patagonia! Contact me at the bottom of this page to find out more about this and other trips. Images from the Patagonian region in Argentina and their sister mountains in Chile, Torres Del Paine National Park, need no introduction. 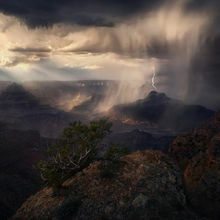 From first glance the viewer is treated to something truly memorable, unique in shape and scale even among the Earth’s great ranges. 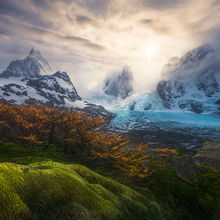 These stunning peaks rise nearly two vertical miles above turquoise blue lakes with ocean-like waves, vibrant shows of autumn colors, wind-twisted forests and some of the world’s largest glaciers outside the Arctic. When visiting such a place it can be easy to feel overwhelmed. I should know, as I hiked more than 30 miles the first day I arrived here! Following that, 11 more trips, 3 major expeditions and more than a year of my life spent here granted me a unique perspective on this region and a local knowledge of how to reach the best places for photography at the best times. Also joining us will be locally based mountain guides who know the region extremely well to assist in getting you off the beaten path, as well as providing useful local info and stories! We will leave the crowds behind for our own places to explore, shoot. We will enjoy backpacking and boat-in locations rarely visited by others, many of which are wild and off any roads or trails. Get ready for adventure! Absolutely necessary to the success of this unique photo adventure is that all participants come prepared to hike and be in solid physical condition. During the course of the trip it may be that I ask you to hike at least 10 miles per day on multiple occasions. While most of this hiking is on well-maintained trails, some is off the trails entirely through brush, talus, streams, snow, the dark and whatever it takes to get the shot. In fact, that is exactly how you get the best shots here, in this world-renowned trekking destination. Too many tours of these parks deliver only the same roadside stops. None of the images you see here can be taken without the efforts and rewards that come with seeing this magical place on foot. Our hiking trips will occur on every good weather days throughout the tour and are very likely to include introductory-level backpacking, where we will be spending a night or two out at backcountry camps. For the backpacking portions of the trip, you will need only a minimum of extra equipment you can easily fly with and select items, such as tents, may be procured from me at no additional charge if needed. 2020 June dates to be announced soon. Use the contact me link below to sign up for my mailing list and be the first to get a chance to sign up, as these tours fill up fast! $3995 / person, 9 days. The American Northwest: Start out photographing the largest trees on Earth with the spectacular Rhody blossoms throughout at peak season. 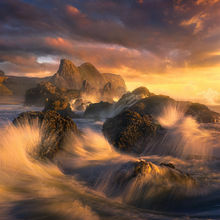 Shoot coastlines with huge sea stacks, wave action and wildflowers lining the shores. Imagine these lush gardens right down to the water's edge with enormous waves and sea towers in the background! As we move north we get to decide - more Oregon coast locations or the mountains or both! One of the best things about my trips is we keep a flexible itinerary, allowing us the react to the weather and current conditions. On this trip we often do the very best locations on the Oregon coast PLUS locations as far inland as Crater Lake, Bend, Painted Hills at peak flower season and of course, the Columbia Gorge. The Gorge is AMAZING, and we get there right at peak season for water flow and greenery. 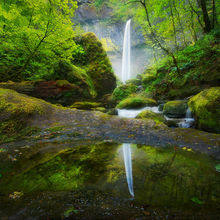 Allow me to show you the greatest green waterfall displays on Earth! Shoot sun beams in the morning soft light and more moss than you've ever seen in the middle of this huge trip, before continuing up north to the Olympic Park! In Olympic you can feast on more coastline, which is the most impressive anywhere, and also the Rain Forest where tassels of mosses hang from the ancient trees at the peak of Spring. Included throughout this 1000-mile long route are dozens of stops that show off the very best of everything in the Northwest. In addition, we have 3-4 places reserved throughout to teach you my post-processing of our trip images at the highest level in addition to all the videos you receive from my library. Tour price includes all meals, dedicated and continuous instruction throughout and dozens of post-production videos yours to keep. Camping and lodging options to fit most any budget are available. This trip is moderate in difficulty and requires participants be able to hike terrain that is occasionally rugged, off-trail or slippery and on trail for a few miles at a time on certain days. Suitable for most people of most age groups who are capable of walking for 2-3 hours at the longest. We will meet in Trinidad, California at 5pm for a trip overview at dinner followed by sunset shoot on the beach. Trinidad is almost as far away from any major airport as it is possible to be in the lower-48, but nevertheless it can be a very scenic and rewarding drive up the coast from the Bay Area, through the Trinity Alps from the East or down the Oregon Coast from the North. Normally folks do take the full day to come in from Portland, Sacramento, SF, Eugene or Medford if flying out. Although most of my clients do prefer to rent their own cars (anything is fine), there will also be the option to carpool with other interested participants in the form of a pre-trip discussion via email, a month or two before departure. 2020 Dates to be announced soon. Use the contact me link below to sign up for my mailing list and be the first to get a chance to sign up, as these tours fill up fast! This summer I’ll be taking a group around one of the world’s most diverse locations - My great state of Oregon. Just like the name says, we will be experiencing it all! From the Oregon Coast to misty mornings on mountain lakes, colorful deserts, enormous waterfalls, lush forests and even Crater Lake National Park!!! It will give you a great opportunity for capturing photographs and learning. There is not another tour you can take that encompasses more diverse scenery and learning opportunities than this one! Our trip will focus on doing everything possible to get to the best locations at the best times. It will be an action-packed in the field, and an adventure exploring the digital darkroom. You may bring your laptop computers if you’d like (not necessary but useful for each) to our many sessions on Digital Post-Processing, featuring an entire world of new techniques and my completely unparalleled approach to the art of making your photos look their best! We will meet for this trip in Newport, Oregon, on the evening we start the trip for a discussion over dinner followed by sunset shoot! Newport is accessed via 3-4 hour drive from Portland international airport. Most of my clients do prefer to rent their own vehicles (and sometimes camp in them like I do), however carpooling is also an option I explore via a group email to any interested parties a month or two before departure. 2021 July dates to be announced soon. Use the contact me link below to sign up for my mailing list and be the first to get a chance to sign up, as these tours regularly fill up very quick. I keep the group size the smallest on any of my trips here as well. My signature trip. There is nothing else like it. In Alaska I dedicate myself to giving you a photo experience that is totally unforgettable and unique in photography. These trips fill up fast and years ahead, often with the many returning clients of mine who want this experience, so signing up for my mailing list is a great way to find out if any spots become available! In preparation of your joining me here on these trips, I have spent hundreds of hours reviewing maps and satellite images of fifty thousand square miles of these spectacular peaks and completed 8 previous expeditions here. I have done more than 200 hours in helicopters scouting terrain from the air, finding countless gems along the way. I’ve done 35 days solo trekking continuously from one side of these mighty ranges to the other and seen miles-long crystal clear ice caves, wildflower gardens, glacial rivers that stretch for dozens of miles and waterfalls so abundant they have no equal anywhere. This is NOT the cruise-ship Alaska. This is the REAL Alaska, that last frontier that will provide you with a sense of wild adventure beyond compare. Imagine starting your day exploring by kayak among icebergs or inside a miles-long network or blue ice caves and then shooting spectacular wildflower meadows near the same campsite at sunset, miles from any other person! This trip is inclusive of all outfitting and wilderness equipment as needed, all transportation, several hours of time in helicopter aerial shooting/transit, most meals, dedicated and continuous instruction throughout and dozens of post-production videos yours to keep. This trip is rated moderate in difficulty and is suitable for people of most ages and ability levels who are in good physical health. 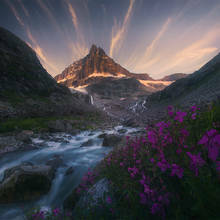 The Alaskan wilderness can be a very rugged environment which may require some athleticism on the part of participants at times, or in select areas when positioning yourself to shoot. All participants will need to be able to carry up to their regular camera gear, clothing, snacks, etc. over rough terrain for short distances for up to 1 hour at a time. Outside of this basic requirement, participants looking for additional hiking options will have the opportunity to do select hikes from our base-camps rated at difficulty levels 1-3, with 3 being most advanced. I do not feel the difficulty of this trip is terribly high, but all should be prepared for some slippery/steep terrain over short distances as we make our way into shoot blue ice caves, glaciers and waterfall/cascades. We will meet in Juneau, Alaska at 5pm for trip overview and discussion over dinner the first day. Juneau and all hotels in town are widely accessible via direct flights from many major airports in the US and is easy to reach. This is our first home base this trip, along with Petersburg, later in the trip and even Yakutat on certain years. Once at base, we're off in the helicopters, bush planes or boats as soon as we get the all clear on the weather! We work with many terrific locals who know the area well and help us will all our transportation needs throughout. 2021 July dates to be announced soon. Use the contact me link below to sign up for my mailing list or waiting lists and be the first to get a chance to sign up, as these tours regularly fill up very quick. It's just like the huge 15-day expedition, but half the time and focused on a single location - a series of backcountry campsites we will set up in the wilderness on the glaciated fiords central Alaskan Panhandle! We will use helicopters to fly between for nearly a week of continuous adventure outdoors shooting ice caves, wildflowers everywhere, enormous waterfalls and huge peaks, plus tons of aerial photography in between! We will meet in Juneau, Alaska at 5pm for trip overview and discussion over dinner the first day. Juneau and all hotels in town are widely accessible via direct flights from many major airports in the US and is easy to reach. This is our first home base this trip. Once at base, we're off in the helicopters, bush planes or boats as soon as we get the all clear on the weather! We work with many terrific locals who know the area well and help us will all our transportation needs throughout. June 12-15, 2020 - 1 spot still available! Located on a secluded island on the spectacular Southeast Alaskan Coast, the village of Petersburg is a known worldwide to outdoors enthusiasts from fisherman to mountaineers. The location is so picturesque many of my past tour participants here have gotten portfolio shots of the great mountain Devil’s Thumb within five minutes of arrival on the commercial jet that swings by a couple times each day! 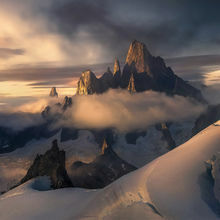 The Thumb, or as I often say the ‘Fitz Roy’ of the North, is about 50 miles West of town as are innumerable other world-class mountains, sweeping glaciers and iceberg fiords. 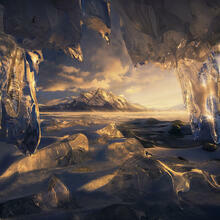 It is in these amazing places, in the wilderness, that our photographic objectives will be met. The weather in Petersburg is normally (based on averages) as good as it will get throughout the year in the month of June, but that doesn’t mean it won’t be unpredictable, so I this trip will take advantage of every possible way to get out there! Boats, Vehicles, Kayaks, Drones and Helicopters! The trip kicks off the morning of June 12that about 11am when your commercial flight (usually from Seattle) deposits you directly into town, where I will pick you up at the airport personally. Flight details will be confirmed and sent out to you 6 months before the trip and can normally be purchased ‘last minute’ with little change in fare. I will shuttle you back to the a local Inn, where we will stay with the best view in town overlooking the Harbor for this night, the 12th, only. This evening, conditions permitting, we will take to the air for our first helicopter groups headed for the Thumb and the Boundary Ranges! Starting this very first afternoon groups of 2 at a time will be flying with me and my good buddy Wally, who’s been the only pilot and helicopter mechanic in town for three decades! Imagine sweeping glacial views and spectacular crevasses below vertical walls a mile high on enormous peaks! Sometimes even, on very rare days, we can even shuttle the group via helicopter up to a CAMPSITE high on a glacial ridge in the mountains overnight when weather and time permit. Camping is the only way one can truly get into Alaskan photography. Almost all locations require wings or a boat to access, and in the case of boats you can bet we’ll be doing a lot of that too! We have our own boat for the day of the 13thand 14th, and it’s a specially designed landing craft which is great for seeking out the perfect iceberg views and hidden waterfalls, for which this area is among the best on Earth. The boat will be taking us ultimately out to a camp I have made in the rainforest for the night of the 13th, for the purpose of using the 6 kayaks we will take with us also! Here, we will set up our camp and say goodbye to the landing craft which will leave us in the wilds overnight! From our kayaking camp we will see rainforest, huge glaciers, icebergs, great mountain compositions right from the beach, and of course calving ice – bergs the size of a large house breaking off the 300ft high face and splashing down before us! In our bay camp, there is also much wildlife, including all the seals and seabirds you’d want to photograph. Drone photography opportunities abound as well, with easy options for getting great video or photos of the ice faces, glaciers and hanging waterfalls up close! We don't return to Petersburg until the evening of the 14th, when we have another opportunity for helicopter photography trip scheduled, if needed, weather permitting. Also into the AM of the 15th is available as well, and shortly after that we will conclude the trip at noon, prior to the 2pm departing flights. The first evening and last evening of the tour are intentionally very flexible so we can react to whatever the weather gives us and adjust times/dates for boat/helicopter photography as needed! If we want more time with the boats/kayaks or the helicopter, we can do either! The most difficult things we do are setting up camps and getting into and out of kayaks. There is little or no hiking required, and any backpack is fine for carrying your gear. We will meet in Petersburg, Alaska as described above at 11am the day the trip starts. This amazing location has been my most popular of all the trips, and these spaces often fill by word of mouth on other events I conduct. Occasionally openings do come to my mailing list, however, which is the best spot for you to be notified if you are interested in 2021 or later! This is a trip that unquestionably puts adventure first! This 9 day trip will feature helicopter-in wilderness camping in the most spectacular setting you can ever imagine. We will use multiple helicopters on multiple trips to carry our camping and cam-era gear to various locations inside the heart of one of the most rugged and isolated regions on the continent, a place you have almost certainly never seen any pictures of…until now! To say the Pacific Mountains here, in central British Columbia, are an amazing location is an understatement. These are Alaska-quality glaciated high peaks as jagged and impressive as they come. Almost all the peaks we will be shooting (the best ones of course) catch the light at both sunrise and sunset and down below we will be absolutely immersed in everything from wildflowers to waterfalls to ice caves the entirety of the trip. In fact, the I believe the wildflower gardens here are so lush they rival any other place on the continent! The trip will be outfitted to the extent you would like it to be. Full camp set-up for anyone not possessing tents, bags and pads is already included as well as all meals in the backcountry. Helicopters are included in the costs as is ground transportation. Lodging the night before departure will be at a lodge in Bella Coola, BC, which we will rent out specifically for our trip. I need all participants to be capable of hiking steep and rugged (but not technical) terrain for short distances. Otherwise physical demands are not significant other than one should be able to hike a few miles. Additionally, I may provide cram-pons and ice axes for glacial travel, should you want to experience some time in the ice. We will meet in Bella Coola, British Columbia for this trip, which is a tiny coastal village occupied by native tribes and a handful of Norwegians who came in the late 1800's. There are 1-2 flights per day via Vancouver BC which can be booked through most air services. A vehicle will pick you up at the airport, which is a single trailer, so easy to find! You may use the "contact me" link provided below to inquire about signing up for the mailing list and to receive additional information about this adventure! December 3-14, 2019 - NO OPENINGS! November 30 - December 11, 2020 - 2 spots open! This huge 12-day trip makes a broad loop around the three best regions for photography in the Southwest US region which spans at least 10 National Parks, many more national monuments and scenic areas, and covers every climate zone in the Southwest from the highest 14‐thousand foot peaks to the most unique sandstone in the world to the hottest deserts! You name it we do it. There is no trip better than the Southwest for the pure number of photos you can expect to come back with. Tour price includes all meals, outfitting of outdoor gear/equipment as needed, dedicated and continuous instruction throughout and dozens of post-production videos yours to keep. Camping and lodging options to fit most any preferences are available and arranged for you on a nightly basis. We will meet for this trip in Kanab, Utah in the early afternoon of our starting day. Kanab is accessed via 3-4 hour drive from Las Vegas, which makes a convenient loop, also located about the same distance from our end point. Most of my clients like driving their own rented vehicles, and some of them even use their trucks or SUV's as beds if camping proves more convenient on any nights, as I often do myself! Others prefer carpooling options with other participants, which I help to arrange before every trip.